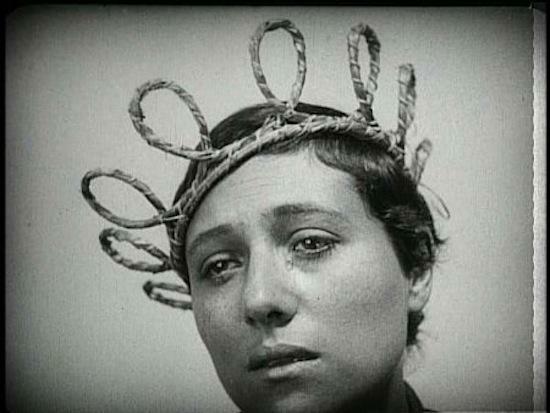 This Thursday, September 12, London's Genesis Cinema will be hosting a screening of The Passion Of Joan Of Arc, Carl Theodor Dreyer's landmark 1928 film tracing Joan's trial and execution. Accompanying it will be a soundtrack of records taken from the back catalogue of pioneering German label ECM Records, selected and mixed by Scanner, aka Robin Rimbaud. For full details and tickets, head to the event's Facebook page; in the meantime, we asked Rimbaud to tell us a bit more about the occasion. Can you tell us about The Passion Of Joan Of Arc and how you came to do the soundtrack? Robin Rimbaud: The Dreyer film is an absolute classic, the cinematography alone is extraordinary, matched with a script that transports you. I had last seen the film as a keen student in the 1980s on a scratchy print at the Scala cinema in Kings Cross (mostly to marvel at Artaud in the film). Now curiously the Scalarama Festival has kicked into life, resurrecting the dusty perverted ghost of the original eclectic cinema programming and chose this film as part of their film screenings at my favourite local cinema in the East End, the Genesis Cinema. Having frequented the Genesis for some years now (almost every week of the year in fact) I'm now their unofficial local 'celebrity avant grade musician' patron and agreed as soon as they spoke about an idea of performing a new score. Indeed I recently held my wedding celebration at the cinema. You're using catalogue music for this, an interesting approach. How did you go about putting it all together? RR: With little time and little budget, the choice of ECM Records seemed very appealing. Having released over 1000 albums traversing the world of ambient, jazz and acoustic music, it was rich for mining. I went through all the materials I have in my own collection and chose what I felt to be work that would contrast, compliment and combine into one rich emotional score. Who can the audience expect to hear? RR: It's going to be a devastatingly moving experience, taking the audience through this profoundly spiritual and tormented tale with music excerpts from, among others, John Cage, Arvo Pärt, Steve Reich, John Tavener, Sidsel Endresen, Victor Kissine, Jan Garbarek and Jon Hassell. I'm hoping that they will be transported into a visionary moment, where time is temporarily suspended. So my advice would be, bring tissues. Have you added any of your own sonics? Are you mangling the music? RR: I've tried to remain as respectful as possible to the original music works but couldn't resist treating and playing around with pitch and processes a little, so certain passages will be looped against others and I'll be triggering various samples from artists across and through other works during the performance. Having said that it will still retain the essence of the ECM label mood and texture. It's a film that quite often gets used for live soundtracks - did you watch any previous ones or were you keeping your mind clear? RR: As I said I saw it back in the 1980s and have no recollection whatsoever of the score I would have heard and have consciously not listened to anyone else's interpretations of this to offer me rather a blank slate to work with. What else do you have planned for the rest of 2013? RR: Scanner adventures continue far and wide. Live_Transmission: Joy Division Reworked goes on the debut UK tour with Heritage Orchestra at the end of September, opening in London at the Royal Festival Hall and then travelling to 11 cities. Then I'm giving the first of hopefully many masterclasses in The Joy of Sound at Alain de Botton's School of Life. I'm premiering a new pop oriented act at the end of the year in Poland in preparation for more European shows in 2014 with Polish singer Sasha Strunin in a collaboration that combines minimalist electronics with live voice in a highly energetic manner, a kind of Lady Gaga D.A.F in a way. I'm also beginning new projects with King Britt from the USA and Vernon Reid of Living Colour, but goodness knows what shape they will take!